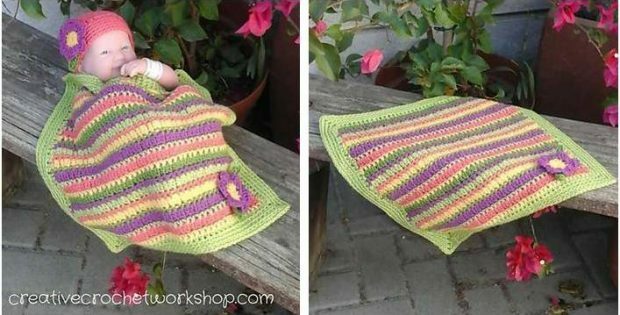 Make this Cluster Striped crocheted baby blanket for a friend’s newborn. The beautiful and cozy piece makes for a totally thoughtful present. Craft it in your friend’s favorite colors for a personal touch! In fact, this pattern is an ideal project for experienced beginner crocheters to work on. Once completed, the crocheted blanket should measure approximately 15 inches wide and around 12 inches high. In metric units, the finished crocheted preemie blanket should have a width of about 38 cm and a height of roughly 30 cm. This crochet pattern is a lovely design by Joanita Theron. In fact, you can access the FREE pattern for this crocheted baby blanket from the Creative Crochet Workshop website. Featured image: Joanita Theron/ Creative Crochet Workshop – thank you!